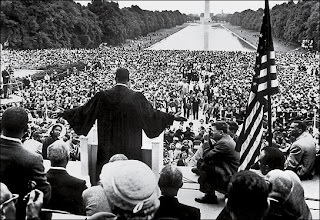 "I had a dream" - the 1963 speech that resonates today"
Today is Martin Lurther King day in the United States, the nearest Monday to his actual birthday of January 15. It is a national holiday-- schools, and government offices and many businesses are closed. In case some of you don't know, Dr. Martin Luther King, born in 1929, was an African-American civil rights leader who was assassinated in 1968 at the age of 39. His most famous speech, and one of the greatest speeches of all times, is the speech from the March on Washington in 1963, the famous "I had a dream speech", the best remembered part which is shown below. Before the civil rights movement took hold in the United States in the 1960's, African Americans, were extremely discriminated against. In fact, in the Southern States, they went to segregated schools, could not use the same facilities or restaurants as white people, and had to sit in the back of the bus or any other transit facilities. The United States has made great progress in the past 50 years, and now has an African-American President, something unimaginable in Dr. King's time. Let us all reflect on how we treat others, inworld and out, in honor of this great man. 2015 also has special significance as the 50th anniversary of the famous series of freedom marches from Selma to Montgomery Alabama, led by Dr, King for voting rights. The controversial movie Selma, now playing in theaters, tells the story of this March, and Dr. King's role in bringing equality to the United States.